Economic, social and technological changes driven by global megatrends have an impact on all industries, including professional services. The impact can include new competitors, subscription-based services, technology and analytics, new workforce dynamics and price pressures. Automation trends dramatically reduce routine tasks. Professional services firms are under increasing pressure to deliver results that have a recognizable impact on their client’s business. To grow and thrive they will need to adapt by focusing on the value created and not time spent on the project. What if you could stop worrying about resource utilization and start focusing on value-add and growth? What if you could easily shift focus to the most profitable services? What if you could manage your business in real-time to be smarter, faster, and simpler? Consider SAP S/4HANA Cloud For Professional Services solution, which can help you to deliver value to clients profitably by empowering front-line professionals and by the managing entire project cycle from one system. End-to-end coverage of the entire project cycle in one system is not just a catchy marketing phrase. SAP S/4HANA Cloud For Professional Services is a single solution to create and manage all data related to the projects. You can have a complete view on the commercial aspects of the project, finance, procurement as well as the total workforce whether permanent or contingent, in real time. Having consistent finance processes throughout the whole enterprise means that you can get paid faster with minimized need for reconciliation. With SAP S/4HANA Cloud For Professional Services you can even create one single customer invoice with all the details for time and expenses to provide the transparency that the clients are seeking and to increase customer satisfaction. We’ve included support for project profitability analysis with real-time visibility into the project margins. Moreover, you can analyze the data across the projects and clients and create forecasts. With a unified journal, real-time insight into the financial processes and managerial accounting data as well as text-based search on any master data, document, and process-related information at your fingertips, you can make informed decisions in real-time, focus on more profitable projects and increase your organization’s overall profitability. People capital is the main asset of Professional Services organizations. Your ability to assign people with the best-matched skills at the right moment to customer projects is critical for customer success and for achieving profitability of the project. 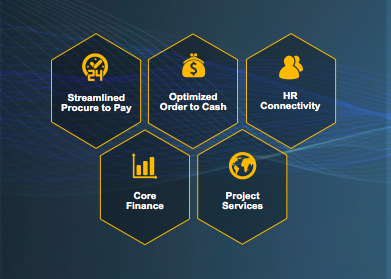 SAP S/4HANA Cloud For Professional Services is natively integrated with SAP Success Factors, Employee Central and S/4HANA Cloud to deliver insights into the overall workforce, including contingent workers as well. Supercharged with the powerful text-based search, the solution gives you visibility to employee information, sills, experience and availability so that you can staff your projects quickly, with one source of truth in the cloud. Experience what SAP S/4HANA Professional Services Cloud can do for you today with a free 14-day trial.